The GeoCert geosynthetics testing laboratory is a specialist facility for testing geosynthetic materials and Filter Sleeve™. The Laboratory holds an ILAC-MRA IANZ accreditation to the ISO 17025 standard for its scope of testing. This is a world-class, third-party accreditation which demonstrates a high level of independence and accuracy, giving certainty to our customers. 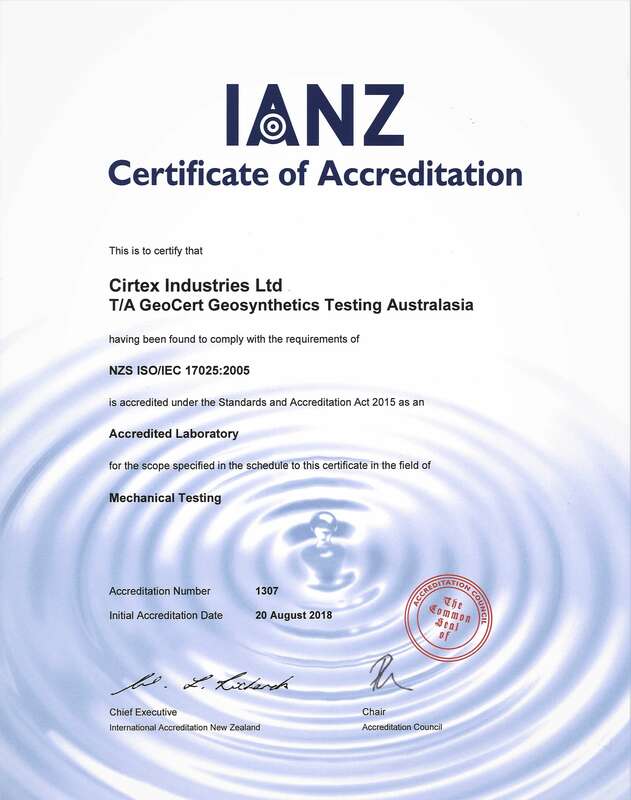 Cirtex utilises the GeoCert laboratory for compliance testing of geotextiles in accordance with NZTA F/7 clause 7, batch testing where required to NZTA F/7 clause 9.2 and compliance testing on Filter Sleeve to the RMS 3553 specification. This modern laboratory is equipped with state of the art, world-class equipment and independently accredited processes which allows Cirtex to offer a higher level of certainty and support to the industry in New Zealand. In addition, this facility provides exciting opportunities for research and development, and project specific testing to optimise designs. How can I get testing done? The laboratories capabilities are not limited to the testing scope as stated above. Our laboratory facilities have the equipment and resources available to do a wide range of research and development testing and we are always looking to improve on our ever-growing testing capabilities. If you have testing requests for Geosynthetic Materials or FilterSleeve, please get in contact with us as we would be glad to assist. Please note that all testing outside of the IANZ scope as stated above is outside the scope of the laboratories IANZ accreditation. While these tests are not IANZ accredited, all tests still meet the strict requirements of the ISO 17025 and ISO 9001 standards and will most likely be added to the IANZ scope of accreditation in time.